Copyright ©2011 Baishideng Publishing Group Co., Limited. All rights reserved. Author contributions: All authors made an equal contribution. Pancreatic cancer is difficult to diagnose at an early stage and is associated with a very poor survival. Ten percent of pancreatic cancers result from genetic susceptibility and/or familial aggregation. Individuals from families with multiple affected first-degree relatives and those with a known cancer-causing genetic mutation have been shown to be at much higher risk of developing pancreatic cancer. Recent efforts have focused on detecting disease at an earlier stage to improve survival in these high-risk groups. This article reviews high-risk groups, screening methods, and current screening programs and their results. Pancreatic cancer is a deadly disease with more than 277 668 new cases and 266 029 deaths worldwide in 2008. The median age at diagnosis is 72 years, with an age-adjusted incidence rate of 11.7 per 100 000 men and women. Unfortunately, mortality rates for pancreatic cancer have not significantly changed for several decades. For example, in the United States, pancreatic cancer is the fourth commonest cancer killer. Although accounting for only 3% of new cases, pancreatic cancer is responsible for 6% of all cancer deaths each year. Most patients with symptomatic pancreatic cancer have advanced and/or metastatic disease at presentation, and as a result, the overall 5-year survival rate is only 5.6%. Even patients with resected, margin-negative pancreatic cancers have only a 22% chance of being alive at 5 years[2,4]. As patients with pancreatic cancer have a median survival of 6 mo from diagnosis, recent efforts have focused on detecting disease at an earlier stage as a way of improving survival. Because the disease is uncommon, and because we lack a simple, cheap and safe, non-invasive test, general population screening programs are neither feasible nor cost-effective. However, 10% of pancreatic cancers result from genetic susceptibility and/or familial aggregation. Individuals from families with multiple affected first-degree relatives with pancreatic cancer, and those with a known cancer-causing genetic mutation have been clearly shown to be at much higher risk of developing pancreatic cancer. Accumulating data suggests that screening of these high-risk groups might be of benefit. Individuals at high risk of developing pancreatic cancer are either part of inherited pancreatic cancer syndromes with a known genetic mutation or are members of a family with at least two first-degree relatives affected by the disease. At present, screening programs are usually targeted at individuals with 5% or greater lifetime risk of developing pancreatic cancer. Peutz-Jeghers Syndrome (PJS) is an autosomal disorder caused by germline mutations in the STK11/LKB1 tumor suppressor gene. These patients are at risk of esophageal, gastric, small intestine, lung, breast, uterine, ovarian and pancreatic cancer. Giardiello et al have demonstrated that the risk for pancreatic cancer in patients with PJS is very high, with a relative risk of 132 and the cumulative life time risk by age 65 years of 36%. Hereditary pancreatitis is a rare autosomal dominant disorder, caused in more than two-thirds of cases by a mutation in SPINK1 gene, with a high risk of pancreatic cancer. In this population, the cumulative risks of pancreatic cancer at age 50 and 75 years are 11% and 49% for men and 8% and 55% for women. In individuals with a paternal inheritance, the cumulative life time risk for pancreatic cancer is as high as 75%. In patients with hereditary pancreatitis, smoking has been shown to double their risk of cancer and lower the age of onset by approximately 20 years. Familial atypical multiple mole melanoma syndrome is an autosomal dominant syndrome caused by a germline mutation in CDKN2A (or p16) gene on chromosome 9p21, or in a minority of cases, in the CDK4 gene on chromosome 12[10,11]. Patients with this syndrome are predisposed to develop multiple (more than 50) atypical nevi and multiple malignant melanomas. The individuals with this syndrome have a 20%-34% relative risk of developing pancreatic cancer and a 16% lifetime risk of pancreatic cancer. Hereditary breast ovarian cancer syndrome is associated with germline mutation in the BRCA2 and BRCA1 genes. It is estimated that BRCA2 germline mutation carriers have a 5% lifetime risk of pancreatic cancer. The risk of pancreatic cancer in BRCA1 mutation is 2.26 times that of the normal population. A characteristic single mutation of 6174delT in the BRCA2 gene has been discovered in high-risk breast ovarian cancer families with pancreatic cancer of Jewish Ashkenazi origin. Lynch syndrome is an autosomal dominant condition caused by defects in mismatch repair genes (MLH1, MSH2, MSH6 or PMS2). Recently, it has been shown that, in addition to colorectal and endometrial cancers, these individuals have a ninefold increased risk of developing pancreatic cancer compared with the general population. Data on 6342 individuals from 147 families with mismatch repair gene defects have been analyzed and 21% of families reported at least one case of pancreatic cancer. This study showed that the estimated relative risk of pancreatic cancer was higher for younger individuals (aged between 20 and 49 years), and concluded that individuals with Lynch syndrome and a family history of pancreatic cancer should be included in screening programs. Individuals from families with a strong history of pancreatic cancer have an inherited predisposition of developing the disease themselves. Familial pancreatic cancer (FPC) families have been defined as families with at least two first-degree relatives, suggesting an autosomal dominant penetrance. In addition, expert opinion recommends a subset of these people to be considered high risk and be included into screening: these are individuals with three or more affected family members; one of whom must be a first-degree relative. Families that do not meet these criteria (i.e. families with only one relative with pancreatic cancer or with multiple pancreatic cancers in more distant relatives) are defined as sporadic pancreatic cancer and are not currently considered for screening. Due to the complex nature of pedigrees in pancreatic cancer, in order to take into account the current age of the subject, the age of onset of pancreatic cancer in the family and the exact relationships between family members, a computer-based risk assessment tool, named PancPRO was developed in 2007. The model has been shown to provide an accurate risk assessment for kindreds with familial pancreatic cancer, and further studies are underway to validate this. The program is available free of charge as part of UTSW Medical Centre Dallas at and Bayes Medel Group at John Hopkins Cancer Gene package at John Hopkins (http://www4.utsouthwestern.edu/breasthealth/cagene , accessed 15th June 2010). Unfortunately, the genetic basis for most cases of FPC is not known but studies using segregation analysis have suggested that it is due to at least one rare novel major gene that has not yet been identified. Germline mutation in the BRCA2 gene is present in 6%-16% of patients with pancreatic cancer[20,21]. The association between BRCA1 and pancreatic cancer is weaker but there are reports of pancreatic cancers in documented BRCA1 patients. A mutation in the paladin gene has been described in the affected members from families with FPC under surveillance at Washington University but this has not been confirmed in other studies. The 4q32-34 region has been previously identified as a potential locus for FPC in a large American family, however, this locus seems unlikely to harbor an FPC gene in European families. Sequence analysis in FPC has revealed six genes previously described in neoplasia/carcinogenesis: Apolipoprotein A4, CEA, Keratin 19, Stratifin (14-3-3 sigma), Trefoil Factor, and Calcium Binding Protein S100 A6. The pattern of frequency suggests that these genes are associated with conditions that produce significant desmoplastic responses and are difficult to differentiate from chronic inflammatory processes. Apolipoprotein A4 is preferentially expressed in familial patients, suggesting the importance of fatty acid synthesis in carcinogenesis but this requires further investigations. A more recent study has identified the PALB2 gene as a pancreatic cancer susceptibility gene. Even without knowing the gene that causes FPC, the risk of pancreatic cancer in these kindreds has been estimated. Prospective analysis of incident pancreatic cancers in Johns Hopkins’ National Familial Pancreas Tumor Registry kindreds, performed as part of the Johns Hopkins GI SPORE study, has demonstrated that the relative risk of pancreatic cancer in persons with two affected first-degree relatives is 6.4% and the cumulative life time risk is 8%-12%. In individuals with three affected first-degree relatives, the relative risk for pancreatic cancer is 32% and the cumulative life time risk is 16%-32%. People with a pair of relatives related by first degree have an 18-fold increase in risk and an estimated life time risk of 9%-18%. The age of onset in pancreatic cancer kindreds appears to be important. The risk of pancreatic cancer is higher among members of FPC kindreds with a young onset (age < 50 years). Risk survival analysis shows that the life time risk of pancreatic cancer in FPC kindreds increases with decreasing age of onset in the kindred. Interestingly, this was not true for sporadic pancreatic cancer. For example, the life time (by age 80 years) risk of pancreatic cancer was 15.7% for individuals with one or two first-degree relatives with pancreatic cancer who came from a family in which one of the members of the family was diagnosed at age 40 years. In this family history group, the cumulative incidence of pancreatic cancer decreased to 7.1% when the youngest age of onset of pancreatic cancer was at 60 years and to 3.1% when the youngest age was at 80 years. The life time risk rose to 38.9% for individuals with three first-degree relatives with pancreatic cancer who came from a family in which one of the members of the family was diagnosed at age 40 years. Smoking is a strong risk factor in FPC kindred, particularly in men and people younger than 50 years of age, because it increases the risk of pancreatic cancer by 2-3.7 times over the inherited predisposition and lowers the age of onset by 10 years. There are three known precursor lesions to pancreatic cancer: intraductal papillary mucinous neoplasm (IPMN), mucinous cystic neoplasia (MCN) and pancreatic intra-epithelial neoplasia (PanIN). Main duct IPMN has a higher frequency of malignancy (range: 60%-92%, mean 70%) compared with branch duct IPMN (range: 6%-46%, mean 25%). PanIN is by far the commonest lesion and three grades of PanIN have been described as cellular atypia progresses from low-grade dysplasia (PanIN-1) to high-grade dysplasia (PanIN-3). Molecular studies have revealed K-ras activation in PanIN-1, inactivation of p16 in PanIN-2 and inactivation of p53, DPC4, and rarely BRCA2 mutation in PanIN-3 and invasive adenocarcinoma[31,32]. Non-invasive multifocal precursor lesions, such as PanINs and IPMNs, are more common in patients with a strong family history of pancreatic cancer than in patients with sporadic disease, and precursor lesions are of a higher grade in patients with a strong family history of pancreatic cancer. Studies on pancreases resected from patients with FPC have shown that precursor lesions, even the low-grade PanIN-1 lesions, are often directly associated with lobular atrophy of the surrounding pancreatic parenchyma. In addition, animal studies have shown that it is not the atrophy that causes the PanINs to develop, but rather that it is the PanINs which develop first, producing multiple foci of small duct obstruction, which in turn progress to multifocal lobulocentric atrophy[33,35]. The lobular atrophy associated with these precursor lesions provides an explanation for the chronic pancreatitis-like changes seen in these pancreases. The multifocality of the precursor lesions suggests that an inherited mutation of a gatekeeper gene is responsible for some cases of FPC. While main duct IPMN and large MCN can be detected by computer tomography (CT) and magnetic resonance imaging (MRI), small MCN, branch duct IPMN and chronic pancreatitis like changes are best detected by endoscopic ultrasound (EUS). As pancreatic cancer has such poor survival, the aim of screening is to detect precursor lesions or early pancreatic cancers. A study from the Japanese National Pancreatic Cancer Registry on operated pancreatic cancers has shown that stage I tumors less than 2 cm have a much better survival (58% alive at 5 years) compared with stage IIb (17% alive). Even more, another Japanese study showed 100% survival in 79 patients with tumors less than 1 cm undergoing curative resection. Unfortunately, premalignant lesions and small pancreatic cancers are asymptomatic. Therefore, screening programs have tried to use biomarkers and imaging tests to identify these early lesions. There are no validated biomarkers in use for detection of early pancreatic cancer. CA19-9 is neither specific nor sensitive enough for reliable detection of early pancreatic cancer or pancreatic precursor lesions. In a study of 71 000 asymptomatic patients undergoing abdominal ultrasound, CA19-9 was found to have a positive predictive value less than 1% using a cut off value of 37 U/mL. Currently, many biomarkers have been researched but none is yet in routine clinical use (Table 1). Table 1 Potential pancreatic cancer biomarkers under study %. MIC-1: Macrophage inhibitory cytokine-1; CEACAM-1: Carcinoembryonic antigen-related cell adhesion molecule 1; SPan-1: Monoclonal antibody; DU-PAN 2: Pancreatic cancer associated antigen; Alpha4GnT: alpha1,4- N-acetylglucosaminyltransferase; PAM4: Anti-MUC1 monoclonal antibody. Fasting blood glucose has been shown to be a marker for early cancer in sporadic cases and is currently used by EUROPAC study in high-risk individuals. Molecular analysis of pancreatic juice for K-ras mutation, p53 mutation and p16 promoter methylation is also evaluated in the EUROPAC study. EUS is the main imaging modality for screening these high-risk individuals. In addition to EUS, other imaging modalities have been used in different protocols such as computed tomography (CT), magnetic resonance imaging (MRI) magnetic resonance cholangiopancreatography (MRCP), MRI with secretin, and endoscopic retrograde cholangiopancreatography (ERCP). EUS has been shown to be the best modality to stage pancreatic cancers (sensitivity of 84% and specificity of 97%) and for diagnosing small tumors (Figure 1) and IPMN (Figure 2). EUS fine needle aspiration (FNA) allows cytological sampling of abnormal areas and has an accuracy of 92%. Multifocal non-invasive epithelial precursor lesions (PanINs, small IPMN) are associated with chronic pancreatitis-like changes, including abnormalities of the ducts (ectasia, irregularity, saccules) and parenchyma (heterogeneity, lobularity) and are best observed at EUS. Two thirds of patients screened in the CAPS 1 and CAPS 2 studies were found to have these chronic pancreatitis changes by EUS and ERCP[43,44]. These changes correlate with markers of neoplasia including abnormal DNA methylation in the pancreatic juice, and were significantly more common and more severe in individuals from FPC kindreds than in controls, even after adjusting for age and alcohol exposure. In addition, Canto et al have reported high-grade PanINs and invasive adenocarcinoma arising in patients with benign IPMN, suggesting that in this high-risk cohort, IPMN can be a marker of a field effect of neoplasia. 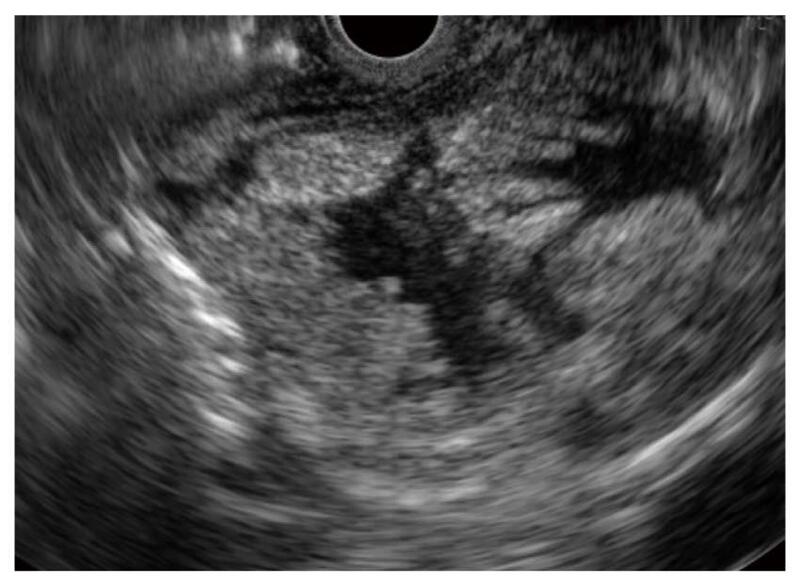 Figure 1 Radial endoscopic ultrasound image of a small (12 mm) early pancreatic cancer, seen as an irregular hypoechoic mass lesion in the pancreatic head. 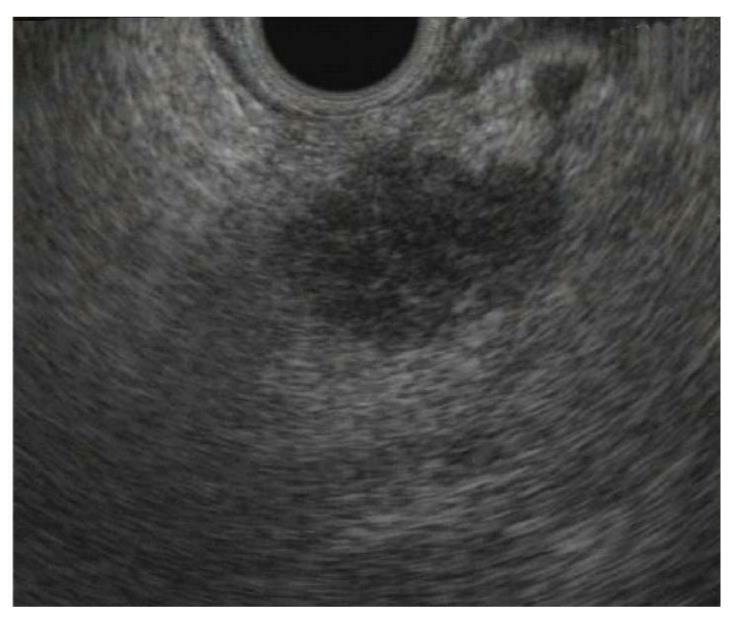 Figure 2 Endoscopic ultrasound image of 17 mm × 7 mm main-duct type intraductal papillary mucinous neoplasm. The duct is markedly dilated and villous papillary projections can be seen arising from the duct wall. Pathology after surgical resection showed high-grade dysplasia. CT and MRI remain the standard of care modalities to identify pancreatic cancers larger than 2 cm. CT use for screening has been discouraged because it is associated with delivering ionizing radiation (10mSv) to patients who most likely have a DNA repair defect. MRI with secretin has better results than MRI and MRCP but it is still unable to visualize very small lesions and can be associated with movement artefacts and claustrophobia. John Hopkins researchers have compared EUS with CT and MRI/MRCP in detecting FPC. MRI/MRCP is superior to CT particularly for detecting IPMNs (71% vs 14%) and EUS detected twice as many neoplastic lesions as CT/MRCP. Some centers have used ERCP to detect saccular dilatation in the pancreatic duct said to be associated with PanIN lesions. However, its use must be weighed against the potential risk of procedure-related acute pancreatitis (3%-5%). Genetic counseling is an essential part of all current screening programs, and practice recommendations about counseling these people about their individual risk, possible preventive and surveillance measures were made at the Fourth International Symposium of Inherited Diseases of the Pancreas in 2007. Currently, there are multiple international programs that screen for pancreatic cancer in high-risk individuals in a research setting. The optimal approach to screening for early pancreatic neoplasia has not yet been established and each protocol is slightly different, but all use EUS as the main imaging modality. The largest program is led by John Hopkins University and involves 24 American Centers of Excellence (CAPS study). The results from the CAPS 1 and CAPS 2 studies have been published and they show that early pancreatic neoplasia can be detected through a screening program in asymptomatic patients. In the CAPS 1 study, 36 patients were screened using only EUS. Six masses were found and these patients went to surgery. The histology showed that two of them had malignant and premalignant lesions (invasive adenocarcinoma and IPMN). In this study, the diagnostic yield of screening was 5.3% (Table 2). Most importantly, the patient with pancreatic cancer is still alive and disease free more than 5 years after surgery. Table 2 Results of screening programs for pancreatic cancer in high-risk groups. 17% diagnostic yield of pancreatic cancer and 16% diagnostic yield of premalignant IPMN lesions. CAPS: Cancer of the Pancreas Screening Study; FaPaCa: Familial Pancreatic Cancer Study Germany. The CAPS 2 study found a 10% diagnostic yield of screening for pre-invasive malignant lesions. In this study, screening was performed using annual EUS and CT. If an abnormality was detected, ERCP was offered. Seventy-eight high risk patients (72 from FPC kindreds with three or more affected members, six PJS) and 149 control patients were studied. Of these, eight patients had confirmed pancreatic neoplasia by surgery or FNA (10% yield of screening): six patients had IPMN with diffuse multifocal PanIN lesions, one had an IPMN with invasive ductal adenocarcinoma, and one had high-grade pancreatic intraepithelial neoplasia (PanIN-3). Five patients had complications (pancreatitis) following ERCP and one patient developed metastatic pancreatic cancer while under surveillance. EUS and/or CT also diagnosed three patients with extra-pancreatic neoplasms (ovarian cancer, renal cancer, ovarian cystadenoma) suggesting that the diagnostic yield for screening and the potential clinical impact may be even greater. The CAPS 3 study is a multicentric prospective controlled cohort study that involves annual screening using EUS and MRCP, MRI with secretin and a panel of candidate DNA and protein markers in serum and pancreatic juice [CA19-9, macrophage inhibitory cytokine-1 (MIC-1), DNA hypermethylation, and KRAS gene mutations] as indicators of pancreatic neoplasms. The study has recently been completed and the results are awaited. Another well-established formal screening program in high-risk individuals is at the University of Washington. Subjects are screened using EUS and the screening begins 10 years prior to the earliest pancreatic cancer death in the family. Patients with normal EUS findings are followed up with repeat EUS at 2-3 year intervals depending of the age when the youngest affected relative had pancreatic cancer. The subjects with abnormal EUS are referred for ERCP and if this is abnormal, patients are offered surgery (laparoscopic resection of the tail to look for PanIN). Patients with abnormal EUS but normal ERCP are offered annual EUS. Out of 75 subjects screened, 15 had abnormalities on EUS and ERCP and went to surgery. The histology revealed premalignant lesions in all: PanIN-3 in 10 cases and PanIN-2 in five. This would give a diagnostic yield of 13% for detecting premalignant lesions. Unfortunately, one patient developed unresectable pancreatic cancer while under annual surveillance . In Europe, a European Registry for Familial Pancreatic Cancer and Hereditary Pancreatitis (EUROPAC) has been created specifically to screen high-risk individuals and this uses EUS, ERCP and molecular analysis of the pancreatic juice looking for early mutations (mt p53, K-ras, P16). The results have not yet been published. A German Study (FaPaCa) enrolled 76 patients in a screening program using yearly EUS, MRCP and laboratory tests (genetic analysis of CDKN2a and BRCA2 gene, Ca 19-9 and CEA). Any suspicious lesion had a control EUS ± FNA after 6 wk and a close follow up at 12 wk. If changes were detected, the patient would undergo operative exploration with intraoperative ultrasound, limited pancreatic resection with frozen section, and if cancer was detected, total pancreatectomy. Ten solid lesions were seen on EUS but only seven could be detected by MRCP. Out of the seven patients, six had limited resections and the histology showed PanIN-3 in one patient, PanIN-2 in one, and PanIN-1 in one, and three benign lesions. These results gave a diagnostic yield of 1.3% in detecting PanIN-3, which is much lower than in previous studies. Given the low yield and taking into consideration the high cost and psychological stress, the German researchers concluded that screening is not justified. These results may be explained by the fact that they were screening a large number of patients who had only a moderate risk of pancreatic cancer (58% of the patients) as they had only two affected family members. The study is ongoing as they still have 17 patients with EUS abnormalities under close surveillance. A recent study from The Netherlands that used only EUS as the first screening modality in 44 high-risk asymptomatic subjects showed a 7% diagnostic yield for asymptomatic cancers and 16% diagnostic yield for premalignant lesions (IPMN like lesions). Most programs continue screening with yearly EUS if no abnormalities are detected. Pancreatic cancer screening programs have reported high compliance rates (64%-94%). A recent study has found that participation in a pancreatic cancer screening program does not lead to a significant increase in risk perception, cancer worry or general distress. Data from John Hopkins shows that patients have found genetic counseling before screening very helpful and these patients perceive their personal cancer risk to be high and would seek predictive genetic testing if it were available. Two studies have looked at cost-effectiveness of screening in high-risk individuals. In the first, a decision analysis was used to compare one time screening for pancreatic dysplasia with EUS to no screening. Abnormal EUS findings were confirmed by ERCP and patients with abnormalities were offered total pancreatectomy. The life time medical costs and life expectancy were compared (assuming a 20% incidence of dysplasia and a 90% sensitivity of EUS and ERCP). The study concluded that screening was cost-effective with an incremental cost-effectiveness ratio of $16 885/life-year saved. Screening remained cost-effective as long as the prevalence of dysplasia was > 16% and the sensitivity of EUS was > 84%. Rubenstein et al have performed a clinical and economic evaluation of EUS for patients at risk for familial pancreatic adenocarcinoma using a Markov model. In his model “Do nothing strategy” provided the lowest cost, the greatest remaining years of life and greatest quality adjusted life years, whereas total pancreatectomy provided the longest life expectancy if the lifetime risk of pancreatic was at least 46%. In the near future, screening of high-risk patients may incorporate biomarkers with high specificity and sensitivity in addition to EUS imaging. Contrast-enhanced EUS may also be a promising technique to differentiate between focal pancreatitis and malignancy but it remains to be seen if it will be useful in further characterizing lesions in high-risk individuals. The use of neural network analysis of dynamic sequences of EUS-elastography is a promising new technique that may provide important additional information in distinguishing benign and malignant pancreatic lesions. Further investigations are required to determine if this technique can guide EUS-FNA to regions most likely to harbor cancer and to exclude cancer in patients with a low probability. More work is required to determine if laparoscopic resection of the pancreatic tail in patients with imaging abnormalities is reliable in detecting PanIN changes, and hence, in establishing real future cancer risk that enables subsequent recommendations for total pancreatectomy. Current screening programs have shown that premalignant lesions and early cancers can be detected by screening but two interval cancers have been missed. The risk of cancer in these groups is sufficiently high to perform screening but methodology needs to be improved. Based on these limited data, the estimated diagnostic yield and potential clinical impact of screening for early pancreatic neoplasms appears to exceed that for other standard indications such as breast cancer screening in high-risk women (95% of women with abnormal mammograms do not have breast cancer). As we learn more about the natural history of premalignant lesions, studies with long-term follow-up are needed. Given the complexities involved, it seems essential that screening of this cohort is coordinated in a multidisciplinary setting and should take place in a limited number of centers with appropriate expertise and facilities.